Hello, this is YOSH from “greenz” ! For the last few years I have interviewed fantastic designers like Stephan Sagmeister, WEFAIL and future farmers about NPOs that follows the theme of “Can design change the world?” for the web designers magazine “Web Designing“. In the early days, there were very few examples regarding the matter, but now we have some community for socially aware designers like “Design21”, also work with something like CSR and cause related marketing. It is time to come get closer to designers and social issues. greenz has featured IDEO’s program “The 1%” before. The task involved collaborating and designing the project’s user manual that relayed useful basic information including how to properly credit individuals and simple phrases such as “Say thank you”. 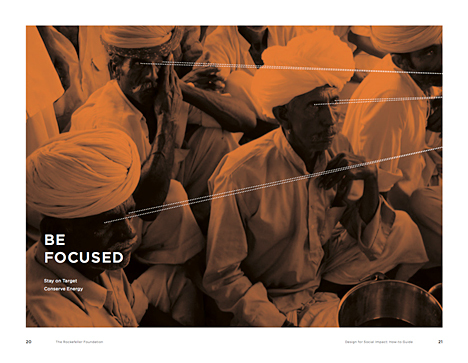 A wide range of groups from NPO global / local to social entrepreneurs are featured in the article “Design for Social Impact”. The article includes helpful tips to prepare designers and the NPO mentally and quickly arriving at a practical design plan. You can read its approach and measures in the IDEO + Rockefeller Guide, and the “IDEO + Rockefeller Workbook” is its worksheet. Let’s look at them from the guide! At first, you need to share what design can do with people who have never dealt with design before. For that, it’s important to provide value of design, be focused on the subject, and make the foundation for the project or set up for success. Next, let’s organise what you can offer (summary of offering). IDEO has a based philosophy called Design Thinking. This is the method to make a prototype and subsequently verify it after having field work researches. By analyzing the method used for the development of new products and services, we might be able to apply it to solve some of social problems. 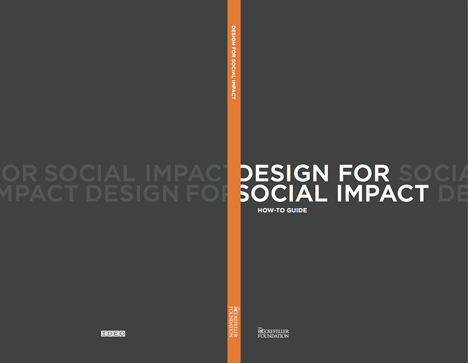 Main pillar for “Design for Social Impact” can be to commit every function of the project of a design company into social issues. For example, the case study shows example of the success in the development of an epoch-making sun optical lantern named “d.light” by IDEO’s engineers, which took only five and a half hours to make. Also the same design company, Celery Design designed the website to record the amount of energy generated at home for the client SUN. They show innovative business cases. If you go to see a lecture, you will find inspiration and a realistic way to approach timing and capacity. You have many choices. 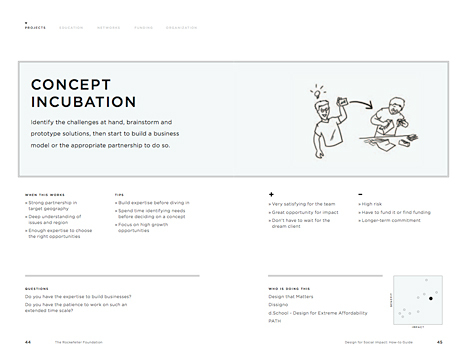 If you understand the problem, adapt well, and can maintain a good relationship with your client, you will be able to incept “concept incubation”. On the other hand, if time is valuable but you are still interested, you should take the valuable “concept brainstorm” lecture that is only one to two hours long. According to circumstances, it may become a business, or you might produce breakthrough by your objective direction. Because of all the problems, there must be a right way at the right time. Based on the above-mentioned, you can think realistic strategy with the work book. You just need couple things ready; make your goal like “where the motivation come from (social meaning, reputation, and employee’s motivations etc)” ,”what you can do (field, target, and period, etc)”, “what is the social impact for you (what is your interests, what do you want to change,etc)”, organize “something you have already started” or “resource that can be used”, and make practical plans. And if you are ready, just do it. 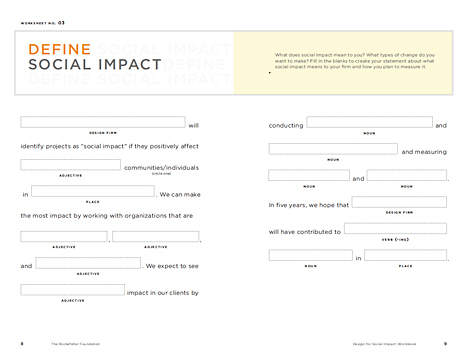 I think that making “Design for Social Impact” sustainable is depending on just your motivation. To achieve your goal, it is important to make your dream into words. Can design change the world? The answer is YES! What you can do as yourself? If you wonder, let’s print out the workbook and start your own workshop!